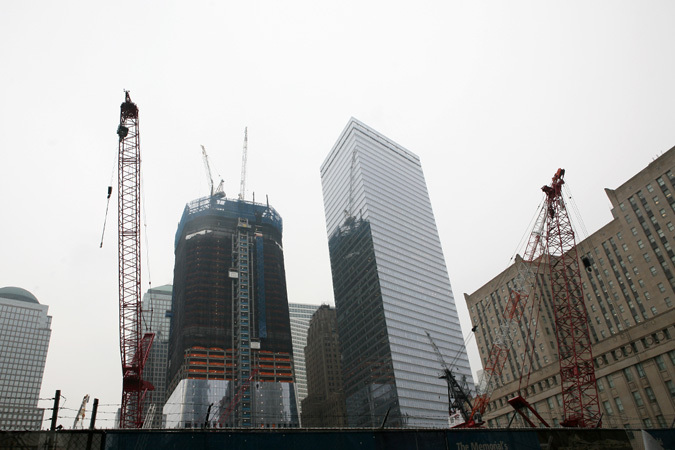 [ As the World Trade Center continues its ascent, AN stops by the massive construction site for a weekly update. ] From behind a blue tarp shielding the remains of the Deutsche Bank building, the sound of groaning metal being bent into submission has stopped. Debris sits separated in two neat piles, one for crushed cement and the other for metal. A polished Peterbilt mack truck with an empty container made its way through gate to take away yet another load. There were no formalities, but by this time next week the last of the World Trade Center ruins will be gone. 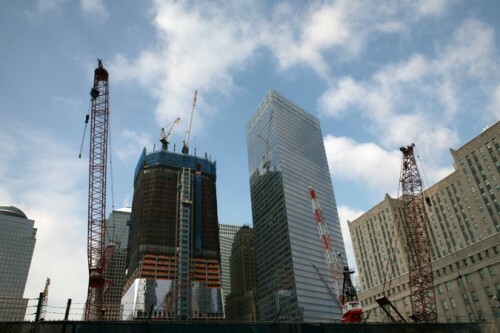 [ As the World Trade Center continues its ascent, AN stops by the massive construction site for a weekly update. ] 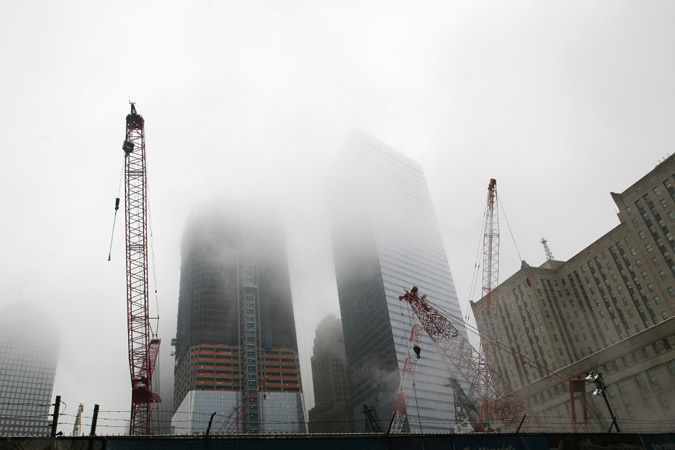 Lunchtime at the World Trade Center site is a colorful sight even on an overcast and foggy day. Hundreds of construction workers in bright yellow and orange safety vests pour into neighborhood delis and pizza joints, but most crowd into the tiny local gourmet food store, the Amish Market. There, burly gents in hard hats hum to the Nat King Cole soundtrack while choosing prosciutto over pastrami. Make no mistake, these guys know food. Back at the site, just two bays of the Deutsche Bank remain to tear down, a row of windows appeared on the northwest corner of One World Trade, and the steel mullions for a glass curtain wall began to wrap their way around Snøhetta's Museum Pavilion. 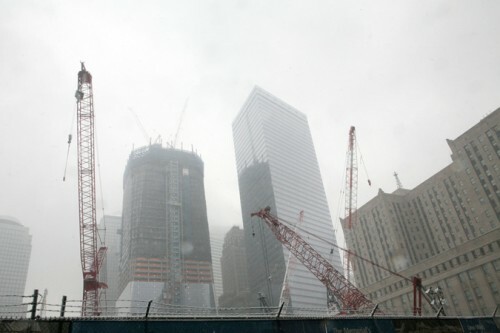 [ As the World Trade Center continues its ascent, AN stops by the massive construction site for a weekly update, nevermind the weather! ] This week, through a haze of snow, we got a glimpse of the last bits of the former Deutsche Bank building. Shrouded behind a fence covered in blue nylon, the once 41-story tower is the last remaining physical remnant of 9/11 to be cleared away piece by piece. With visibility low, the sounds of the site take over. From this vantage, the groaning sound of metal being bent and twisted distinguishes itself from sounds of construction, the swirl of cement inside mixers, the hum of truck engines, and the rhythmic clang of metal banging on metal. At first glance, it seems that the riot of square white panels suddenly appeared on the base of One World Trade, but photos from the past few weeks show that they were going up all along. Closeup shots taken today reveal metal bolts protruding out from the panels. The curtain wall fasteners for the metallic scrim? Each week, AN plays tourist at the World Trade Center construction site. Here's the latest. Last night's snowstorm was a dud when compared to the Boxing Day Blizzard. But a half hour walk around the WTC site reveals just how much extra work the weather can add to a day's labor. By noon, workers were still shoveling out of the mess, removing snow laden tarps and generally slogging through the grayish black mess. When returning to the site week after week, certain design elements begin to reveal themselves. Forms become more familiar and building outlines emerge. This week our camera picked out the pair of "trident" columns from the original towers that are a focal point to the Museum Pavilion designed by Snøhetta. The installation of the Pavillion's primary steel construction was completed on December 22nd. As there are few visible changes on the facade, this week's photos focus on the reinforced concrete at the base of the tower. With much media fanfare, the NYPD opposed initial designs for security reasons. The resulting redesign introduced a fortress-like base and core, which is now visible from the street level. Eventually, the concrete will be shielded behind a metallic scrim, not unlike the one seen next door on Seven World Trade. 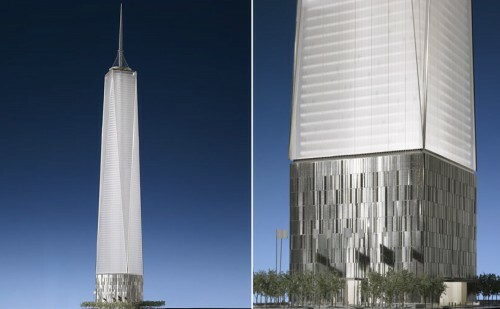 For now though, pedestrians can glimpse the exposed base to get an idea of the tower's extraordinary strength. 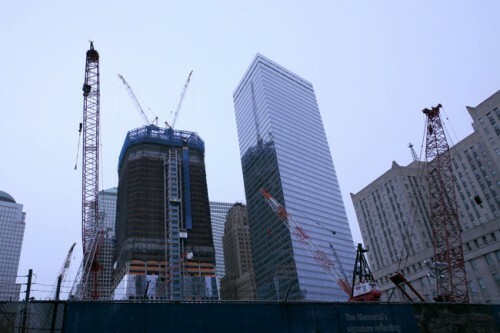 [ As the World Trade Center continues its ascent, The Architect's Newspaper will be checking in each week for signs of progress at one of the country's most exciting construction sites. ] The blizzard did little to deter holiday crowds from flocking to the World Trade Center this week. With few office workers in town, hundreds of tourists crushed onto the slushy sidewalks of Church Street. From behind St. Paul's Chapel, a cacophony of languages could be heard. Construction moved forward with few signs of delay or disruption from this week's snow and by Wednesday afternoon the site was humming as usual. 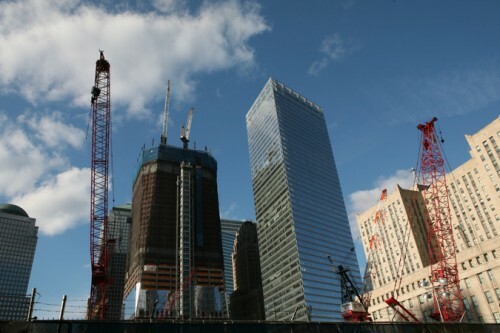 Check out AN's previous weekly photos of the World Trade Center. 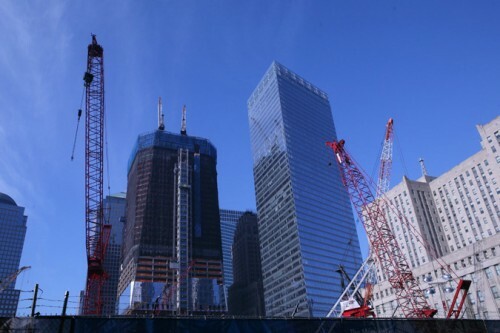 [ As the World Trade Center continues its ascent, The Architect's Newspaper will be checking in each week for signs of progress at one of the country's most exciting construction sites. ] 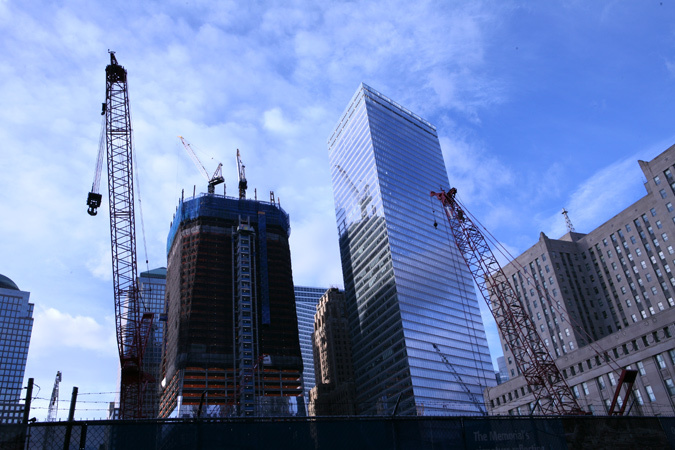 The pre-holiday bustle reached a lull today at the World Trade Center site as much of downtown seems to have headed home. Even the cranes were moving at a sluggish pace; but they're still moving. This week, the facets that form elongated triangular corners began to reflect the sunlight a bit more and another row of windows found their way onto the western facade. The holidays are taking hold, too: At dusk, sparkly lights that run the length of the cranes emerge like stars. The Architect's Newspaper's main office is just two blocks from the Word Trade Center site, so we're keeping a photographic eye on increasingly visible developments at the site. 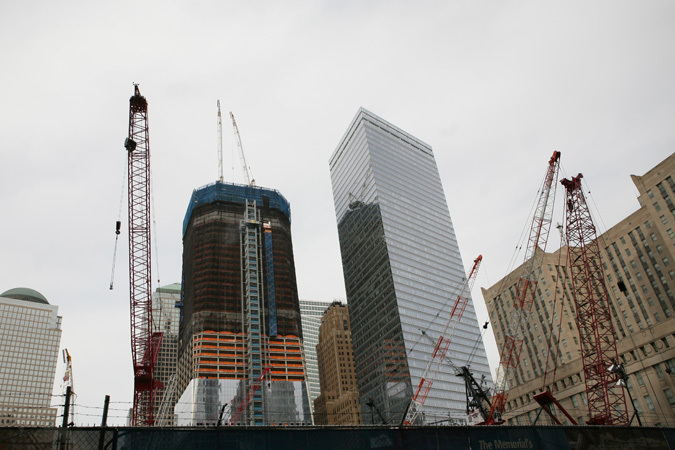 One World Trade will soon break the skyline and all throughout the site there are signs of vigor. Over the last couple of weeks, windows began to appear on some of the structures. It's hard not to be awed, regardless of how unfashionable that may be in an area where locals studiously observe a nonchalant protocol, as though the massive tower were just another visiting celebrity. So don't mind us as we join the out-of-town gawkers and snap away. It'll be at least 4 years before Santiago Calatrava's scaled-back, over-budget World Trade Center PATH station is completed (though as our upcoming feature on Lower Manhattan showcases, everything's been a long time coming, but it seems to have finally arrived). Still, from the start of the interminable process, we've had some of the flashiest renderings around to tuck us in at night. Now comes an illustrated video courtesy the Journal's Metropolis blog that gives us our clearest view yet of just what's planned, as well as what Calatrava meant when he told the New Yorker a while back that he was striving for something akin to Grand Central—a truly great room where the interiors, not the exteriors, would be what truly matters. If this video is any indication, despite all the cutbacks, he's succeeded grandly. One development plan is sold to the public with promises of a certain subsidy level and an expected long-term gain from rent. But conditions change, costs increase, the market worsens, and once it seems too late to turn around and scrap a deal, a developer needs more aid, and the public sector is in a tough place to refuse.[... ]The site, of course, is laden with emotion and politics, and the desire to rebuild after a terrorist attack sets the site in a different category than the traditional public-private partnership. But in layering on the assistance at various different points over the past nine years, what is clear from the latest deal is that the total amount of public assistance is extraordinary and tremendous, and one wonders if the current plan would ever have gone forward had the public known its full contribution from the start. It's a pretty sad reality for what was supposed to be a grand gesture in the face of tragedy. But pulling back from all that good will and high hopes, with the comfort of hindsight, it becomes clear this was just another development deal in New York City, possibly the granddaddy of them all. Look no further than Atlantic Yards or Columbia or, hell, the original World Trade Center itself to be reminded that this is just the way business gets done in this town. Which only begs the question, "How long until the next bailout?" Say, maybe, once the now indefinitely delayed Foster tower gets going again?